Herein I offer to share my experience and opinions using the Astro-Devices (of Ukraine) Parallelogram Standard II Pro, hereinafter referred to as the PSP II. I volunteered to Valentin, one of the proprietors of Astro-Devices, during our conversations after ordering to do so as I had not seen any. Other than our congenial, brief messages through CN, I have no relationship with Valentin or Astro-Devices. This will not be a comprehensive, or even scientific review. I will just share what I would have wanted to know if considering purchasing one of these parallelograms. First off, let me say that I have only been in this hobby around four years. I have owned scopes as small as a 60mm refractor and as large as a 14” Dobsonian reflector. I have owned three sets of binoculars, all of which are your run of the mill low cost units: a Zhumell 20X80, a Galls 10X50 (law enforcement, at least that’s where I got them from…My oldest son who works for the government gave them to me when he realized he had no real use for them), and my current favorite, Celestron Skymaster 15X70s. I have also owned the tripod that came with the Zhumells, an attempt at Gary Seronik’s simple binocular mount, a Peterson Pipe Mount, and now the PSP II. Oh, I also have a fairly generic monopod. The Zhumells went the way of the accidental fall and breakup. I eventually sold off many of its components recovering some of its costs. I think they were too much for the Gary Seronik simple mount, and were not worth the trouble of the Pipe Mount, the latter of which I sold off also. So how did I end up with yet another pair of binoculars and a parallelogram? Well the short version of the story is that I took a look at M45 one morning during exceptional good seeing with my Galls 10X50s and was so smitten that later that day or week (can’t remember now) I ordered the Celestron 15X70s off Amazon. I had previously used an observing buddy’s pair when I had my Zhumells and was impressed with the Celestron’s lightness and clarity. I know about all the horror stories about lack of quality control, but the one thing I know about Amazon is they do give speedy refunds or replacements. I must be lucky, because I love these things. So much so, that though I could handhold them for several minutes at a time, I just knew they would be even better mounted. Honestly, I was considering the Orion Monster Parallelogram, having visions of grandeur (aperture fever), but just couldn’t justify the cost. Looking at more cost effective (for me) alternatives I took a good look at Astro Devices offering for $169 plus shipping. Made sense, except that shipping was almost $50! I couldn’t stomach the shipping cost, so I asked Valentin for a less costly method. He said he could ship them at about half the cost through the United States Postal Service, but it would take 3 to 4 weeks. I went for it. They arrived 2.5 weeks later…right around the time I was rethinking my shipping selection. Remember, I use Amazon, and I am a Prime member at that! Let’s say that part of my selection criteria for purchases are free same or next day shipping options! Packaging was nondescript, meaning effective but nothing to write home about. Frankly, I didn’t care as long as it arrived undamaged which it did. The packaging worked is all. The first thing I noticed was how heavy the parallelogram was. It weighs every bit of 12.5 lbs. There went my idea of using my Nexstar GT tripod. I mean I did initially, and it worked, but barely. Sold it, and bought a CST heavy duty aluminum surveyor tripod from, you guessed it, Amazon for around $50. 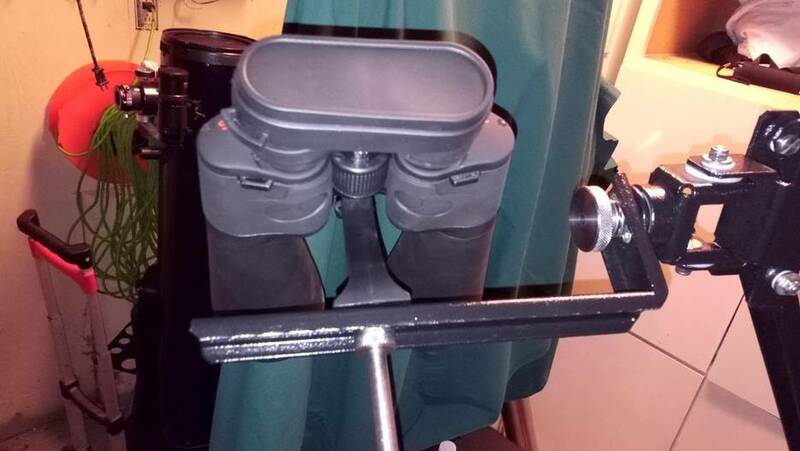 Oh, another item that I needed to replace was the cheap (free) plastic tripod adapter that came with my binoculars. On the monopod, it worked fine. Once I mounted it on the parallelogram, it was amazing how much it wobbled, (shook would be an understatement)! When I replaced it with a solid metal adapter, (yep, a $6 Amazon purchase), that source of vibration was eliminated. Previously, I experienced several minutes, not seconds, of vibration. Unbelievable! Another issue was weights. I ended up using two 4.4lb plastic covered cement weights from an age old dumbbell set I have. I will eventually get around to replacing them, but I think you get the picture by now; I’m frugal… ok, cheap. I like to think that I’m smart, but yeah, I’m cheap. There I said it so you don’t have to. Anyway, they work. Okay, all that to say, I highly recommend the Astro Devices PSP II. Now that I have my Binocular Observing System (BOS), as I have termed it, pretty much complete, I have really enjoyed using it. 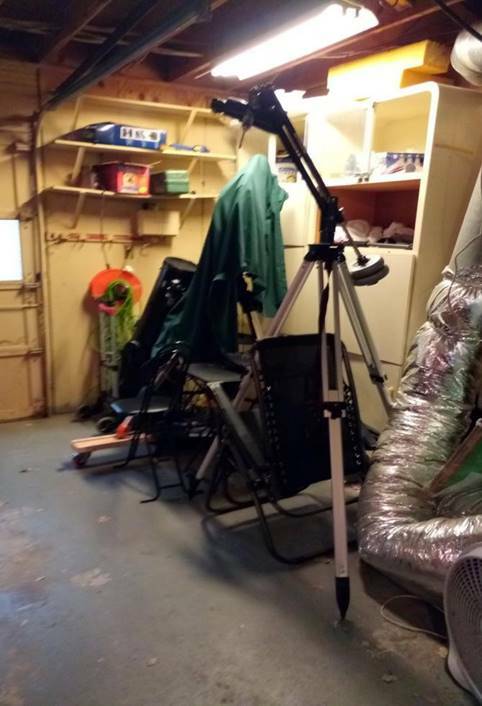 So much so, that several pieces of my astronomy equipment have recently received some serious scrutiny regarding their continued use and retention. I mean seriously, I can clean house! Ok, back to the PSP II. I’m not a little guy at 6’, 240lbs, but at 57, the back is not what it used to be. I carry the whole BOS out of my garage and move it from one side of the yard to the other several times without hesitation. The tripod and parallelogram weigh about the same, and the 15X70s only weigh 4 lbs, so all together, you’re looking at 30lbs. The challenge is the unwieldiness of the setup, but because the binoculars, parallelogram, and weights balance so perfectly, I can move the whole setup without the binoculars or weights swinging during the movement of the BOS. I live in GA in a red zone, borderline white, with tall pines and street lights in every direction. So, if I want to look at the Double Cluster I need to be on the South side of my house, but if I want an unobstructed view of Orion, I need to be on the North side. Other views require me to move to the East or West side of my drive way. When astro imaging I kind of just select targets as thy pass over, but when observing visually I need to move around to get a good number of targets in view in a short amount of time. And that’s the thing, with the BOS, I can get a wide range of targets in a very short amount of time as opposed to the 8” dob and eyepieces. I know, by now you are probably saying I thought this was a review of the parallelogram. Well it is in the sense that it does its job so well it becomes transparent. Please look at the technical jargon on the Astro Devices website for details of its construction. However, like I said, it is solid. Yet, it is extremely flexible. I think it moves in 5 axis, maybe six. What I do know is that once I understood the limitations, (I mean the binoculars are attached to it), I could intuitively move the binoculars in any direction while the PSP II supported their weight. However, the greatest benefit is that once aimed, the target remains exactly where I placed it in the FOV once I let go of the binoculars. I can drop my arms and walk away. When I return, the target is right where I left it, unless of course I leave long enough that the target has drifted out of the FOV! No problem, I can quickly relocate it by loosening the large knurled knob on the L bracket or the smaller one that holds the binoculars to it. It’s like having an extra set of hands, lol. Valentin says the PSP II is designed to support up to a 15 lbs binoculars, and I don’t doubt it. The only limitation I am finding is the vibration settle time. With my current setup, I am experiencing a less than 2 second settle time. I know that could possibly be improved with an even sturdier tripod, but I am satisfied with mine due to the weight and height adjustment. 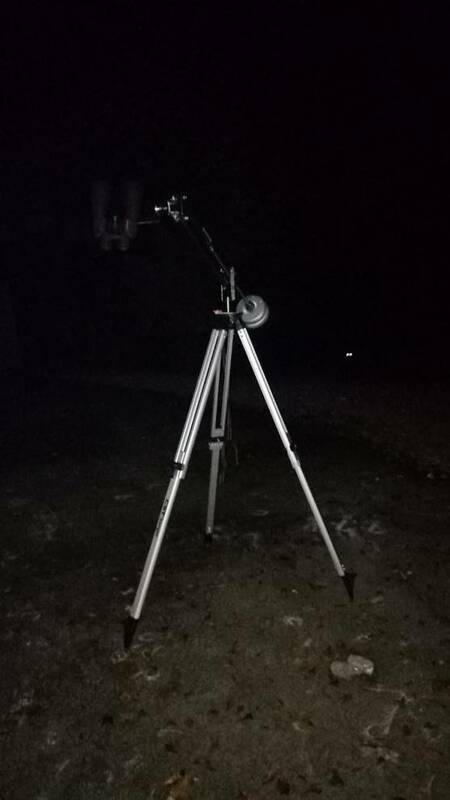 By the way, the CST Heavy Duty Aluminum Surveyor tripod I have has a max height of 63” allowing a max binocular height about 15” taller than that with the PSP II. 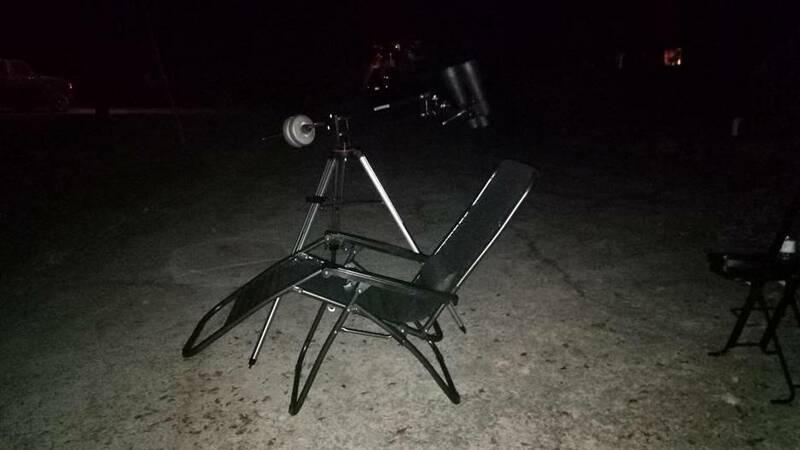 I have mine adjusted so that I can observe standing, sitting in my observer chair or even semi reclined in my zero gravity lawn chair. Back to weight capacity; I so wish I had my 20X80s. At 5lbs, I think they would have been perfect with the BOS. However, I have never owned 25X100s, and the Celestron Skymaster versions only weigh about 9 lbs, and of course I just got to try them out! (Let’s see, what can I sell to raise the funds for a set?) I know the PSP II can handle them, but I am a little concerned with settle time. Also, I think the moment arm effect will limit my ability, or willingness, to move them around as much. Well there you have it; like I said, I highly recommend the PSP II. Though, as you can tell by my experience, you really have to think of it as part of a larger system like my Binocular Observing System or BOS. In closing, I liken the parallelogram to the mount in astrophotography. All of it is important, but most aspiring and expert astrophotographers will agree that the mount is the biggest factor in acquiring good images. I think the parallelogram is similar for binocular observing with binoculars that require some type of mounted solution. As such, the Astro Devices Parallelogram Standard Pro II is a good choice for the task. I have that mount and your experience mirrors mine. Very sturdy mount. Good review. Thanks for the review. Maybe post some clear pictures taken with good illumination to show how the mount works? FWIW, I have the Oberwerks 28 x 110 binoculars and the Orion Monster Parallelogram mount. The views are great but It is just a monster and no fun to set up and move around. Probably heavier than my 8" SCT on an Equatorial mount. Because of this, I don't use it much. Yikes, that sounds like I'm complaining. Sorry. I don't want to. I just want to say I think you have found the sweet spot. I have a question about how reclined you can be. 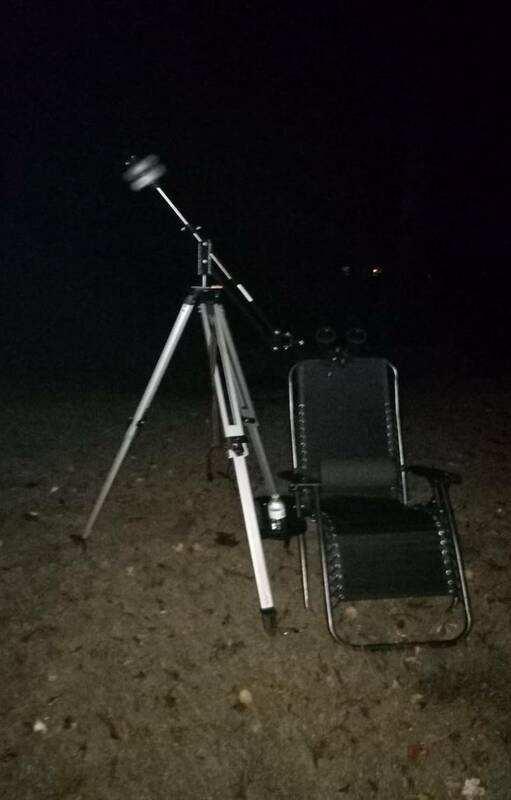 I am asking about observing objects at the zenith from a zero gravity chair. Does the PSP II work for this? I would probably buy this product if I had faith in the previous larger binoculars I have owned. It might have something to do with the fact they are lower priced products like Celestron, Barska and Meade. All were on the high end 80x and all failed the brightness test. I was anxious to see targets better and more of them, but the results were so disappointing I sold the Celestrons and Barska and now I want to sell the Meades. Part of the problem I was comparing them with the performance of a pair of Stellarvue binoculars I still own, they are smaller being 12x60, but the difference was like night and day. The Stellarvues were moderately priced around $160 new, the larger binoculars mentioned were all used and in good shape. I surmised the owners probably didn't like their performance and sold them off or put them away, rarely using them if at all and then eventually got rid of them. I'll stay with the Stellarvues for now and I have to consider the smaller objective is why they produce brighter views as I'm sure a range like 10x50 would be even better. Since the Stellarvues aren't considered premium binoculars, this is evidenced by less than sharp star images, so if I want to achieve quality viewing, I'll just have to bite the bullet and spend more. I would imagine buying a pair in the $500-$600 range, with a 70 maybe 80 objective this can happen. I'm done trying to find premium performance out of these cheap production binoculars, in this case aperture isn't king.